There are all sorts of tools out there, serving all sorts of purposes. Some are free. Some are paid. Some are a great ROI (return on investment) and some, well… But, what tools work well in a virtual team environment? One of the tools that I use the most, for teams, is Skype. Whenever I mention “Skype” to those who do not use it regularly, the first thing they think of is video calls. Yeah, it is true. Skype is wonderful for those video calls. But, that is not all it is good for, especially when talking about teams. Random thoughts throughout the week (added by members any time and read by other members at their convenience). Meeting agenda, right before a weekly 15 min meeting. By clicking on the “call” button, for our scheduled meeting, it will automatically ring everyone on the team. Just like a telephone, if the person isn’t available, they don’t pick up the Skype call. And, if someone is unavailable to answer via Skype, they can IM their phone number into the same group (i.e. ahead of time) and we can add the number and call them on their cell, land line, office number, etc. (instead of Skype). This really opens up the versatility! One way to create a group is to first create a Skype “list” and then open that list, select all, and right-click to create a group. This may vary from platform to platform and for each version of Skype. The real beauty though, is the ability to IM 24/7 as ideas pop into our heads. Those ideas could be discussed via IM “real time” or added to the agenda for the next meeting. #SocialCafe isn’t the only team that I have that uses Skype. Gail Gardner, who has a huge Blogger Mastermind group on Skype, introduced me to the idea of using Skype for that purpose. I also use it for teams that I handle as VP of Marketing for a not-for-profit. The uses are limitless and I don’t know how virtual teams would exist without Skype! Teamwork.com is a project management system that is available online. During my stint in upstate New York, I stopped in and assisted Jim Boykin’s Internet Marketing Ninjas by starting their Project Management Office. Now, project management is something that every company (and virtual team) “should have,” but doesn’t necessarily implement. That said, it is something that actually exists even when people do not realize that it exists. An example would be that you may be communicating with each other via email (or Skype) on how a project should be handled. Technically speaking, you are using email as a communication tool in a project management process! Ok, enough techie talk, eh? Let’s keep it simple. The reason I mention that I have served as a Project Management Director is simply to say I have “been there, done that” and know my stuff about project management enough to be able to make the recommendation for you. And, from what I have used (which also includes Mavenlink), TeamWork.com rocks! Ok, wait. Before you hop over and create a free account and wonder if I have lost my senses… I admit, Teamwork is not the easiest thing out there. But, for project management systems, I think it is easier than most. So, if you are used to using project management systems and you have really complex projects and quite a few team members and deadlines, then you may want to look into using Teamwork. Also, the customer support is same day and stellar! I have also used Mavenlink and they have an excellent support team, too, but it is a bit counter-intuitive, compared to Teamwork. Keep in mind, too, that even if you are a project manager, you want a tool that is easy-to-use for your team members. Teamwork is the type of tool that meets the needs for scope management, identification of critical path, etc., without completely losing the team members that need to use it. Oh, a little trick, too. You can use Teamwork.com for free, if you only set up two projects. This may drive project managers crazy, but what you do is set up the projects as “task lists” (instead of projects) and you can add as many tasks-lists-functioning-as-projects as you like. Of course, out of respect for the company, I should encourage you to pay the $13 or so per month for a paid subscription. There are also enterprise level subscription options for the big companies. Did I lose you, yet? That’s ok… read the next section. It gets easier. 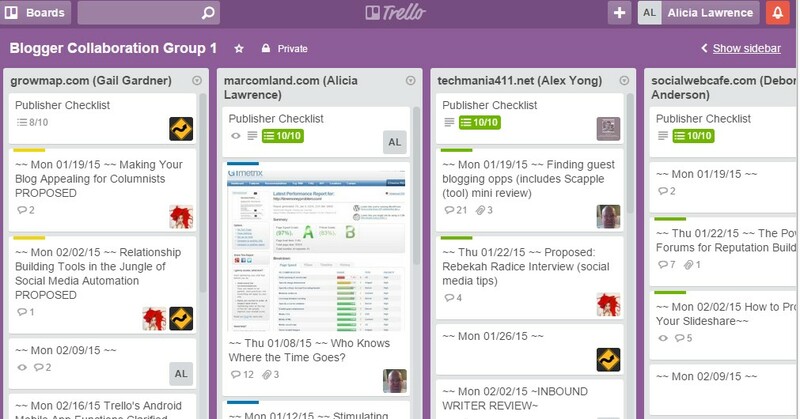 Trello is a great tool that can be used for Google Docs (and all Google apps) and DropBox. Those are just two that probably have already come to your mind when you first started reading this article. But, the list is quite long! Any opportunity you have to share information with other team members presents a possibility of a tool that could be used to optimize the team experience. The key is likely to be efficiency, and that is where the virtual team tools really come in handy. So, what is (are) your favorite tool? Do share with us, in the comment below. I have collected over 200 Tools for Virtual Teams in a Mind Map which is available online at https://www.mindmeister.com/39918845/online-collaboration-tools-2011-nader-ale-ebrahim . I have not update the tools. However, most of them are still working very well. Couldn’t live without Trello. Took me a month at my new job to get my new marketing teammates on it. And who doesn’t love Teamwork?